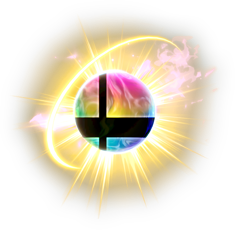 The Fake Smash Ball (スマッシュボーム, Smash Bomb) is a new item in Super Smash Bros. Ultimate for the Nintendo Switch. It was revealed at E3 2018. Although the Fake Smash Ball is an original Smash Bros. universe item, the inspiration for the item can be traced back to the Mario Kart series, which features Fake Item Boxes. These items made their debut in Mario Kart 64. As with the Fake Smash Ball, Fake Item Boxes are obstacles designed to look like the real thing, distinguishable only by an upside-down question mark, lack of spinning, reddish sheen, or some other mark. The explosion also resembles that of X Bombs. Meta Knight and Roy facing a Fake Smash Ball. The Fake Smash Ball exploding. The Japanese name of the Fake Smash Ball of "Smash Bomb" is possibly also a pun on "Smash Ball" (スマッシュボーム and スマッシュボール , respectively), as they only differ by one sound/character. For some unknown reason, the blog post for the Fake Smash Ball on the official Super Smash Bros. website was removed shortly after it got posted. This appeared to only happen in American and European regions, as the blog post remained on the Japanese site. The post was eventually restored the next day, along with two other new blog posts. This page was last edited on April 19, 2019, at 15:48.